THURSDAY, 8 FEBRUARY – Universiti Malaysia Sabah (UMS) and Zunyi Medical University (ZMU), China, have now entered the second phase of the research collaboration since the signing of a Memorandum of Agreement (MoA) between the two institutions on the establishment of The International Joint Laboratory for Ethnomedicine in 2016. The second phase will see a significant expansion of research funding provided by the Government of China under the One Belt, One Road Initiative. 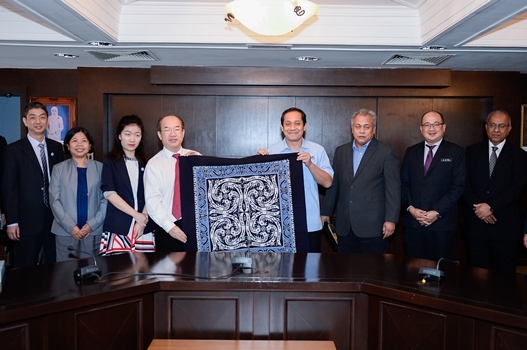 A courtesy visit to UMS by a delegation from ZMU, led by the President, Professor Dr. Jingshan Shi, was held to discuss the progress of The International Joint Laboratory for Ethnomedicine yesterday. During the visit, UMS Vice-Chancellor, Professor Datuk Dr. D Kamarudin D Mudin, mentioned in his welcome address, that Sabah’s rich biodiversity and its array of ethnicities provide great opportunities for enhancing ethnomedical research. Ethnomedicinal studies are fundamental for the discovery of new modern drugs through traditional knowledge. Therefore, the coexistence of traditional medicine and biomedicine plays an important role in improving human health in today’s world. The Vice-Chancellor believes that the ethnomedical research collaboration with ZMU, together with UMS’s Faculty of Medicine and Health Sciences, Faculty of Science and Natural Resources, Institute for Tropical Biology and Conservation and Biotechnology Research Centre will lead to high impact scientific and commercial outcomes.